Daily post inteviewed K.S Lawan and he The Borno State Government insisted that the Boko Haram extremist was created through the excesses of former Governor Alimodu Sheriff. It said the guerrilla warfare of the extremists ravaging the North-East is as a result of illiteracy, bad governance and impunity of Sheriff. Commissioner for Justice and Attorney-General of Borno State, K.S Lawan said this in an interview in Port Harcourt. Lawan said it was sad that the Federal government was yet to apprehend and prosecute Sheriff despite all the notorious facts available to them about his involvement in the creation of what had become a nightmare to the entire world. Lawan who commended the Nigerian Military and the Local vigilante for their continuous efforts in fighting the insurgents, said Boko Haram had been decimated. The Attorney-General said Boko Haram was now weakened and could no longer take any Local government in Borno state. 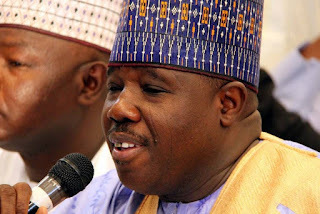 “Alimodu Sheriff is a former Governor of Borno and he ruled for 8years before leaving the state in state of insecurity. “Sheriff created one Ministry of Religious Affairs and appointed someone who was killed during the 2009 mayhem after he was arrested alive by the security forces. “The insecurity that has brought us to this level in Borno is a result of bad governance, illiteracy, lack of respect for the rule of Law and impunity by the administration of Alimodu Sheriff when the Federal government at that time failed to checkmate his excesses and it has escalated up to this level. “Up till today, Sheriff is still moving freely with no one doing anything about it. So, all hands must be on deck if justice must be done to the hundreds of people that have been killed by these ruthless insurgents. “Sheriff should be investigated. He should be arrested and prosecuted with all the facts available to them. There are enough notorious facts indicting Sheriff,” Lawan said. Reacting to the allegation, Inua Bwala who is the spokesman ‎to Alimodu Sheriff said the Federal Government and the security agencies do not have anything on Sheriff. According to Inua, “The Attorney-General has merely made allegations that he cannot prove. What you don’t know is that the Attorney-General is a closer character to the Boko Haram than Alimodu Sheriff. “No individual or group has linked Boko Haram to Alimodu Sheriff anywhere. When Sheriff was Governor, no single local government was under the control of Boko Haram in Borno state. “Alimodu Sheriff left Borno state when people could sleep with their both eyes closed.